Founder and CEO Lexie Norcross’ goddaughter, Sienna, at her weekly music class with Jay and Ray. Studies show that children who are exposed to music have improved language development, enhanced fine motor skills, better social skills, higher IQs, advanced spatial intelligence, increased concentration and basic memory recall. Learning how to read music and play an instrument offers even more mental and physical benefits. Why? A baby’s brain is hardwired to learn music just like language and strengthening the musical pathways in a child’s brain has a proven effect of helping with their overall development. Learning music helps children to learn other things by enhancing their skills. Even our youngest reap tremendous advantages from musical exposure and influence before they can even walk or talk. 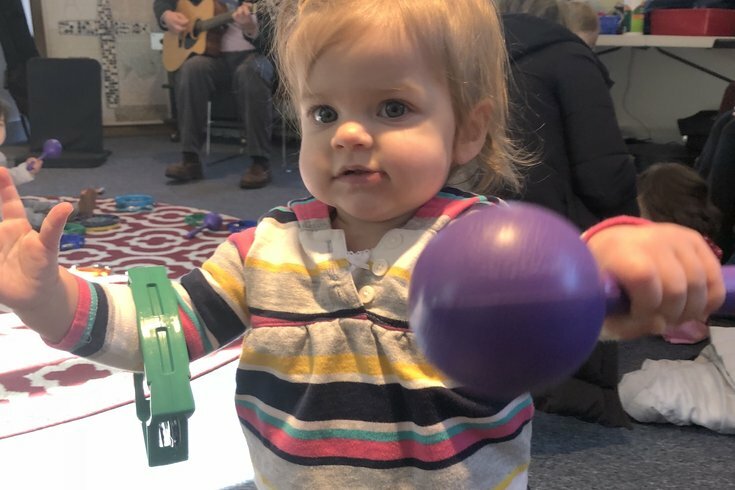 Studies show that 1-year-olds involved in interactive music classes with their parents are better at communicating, are more social, smile more and have more advanced brain responses to sound. Those under one year of age have improved processing of sound and speech. If you are a bleary-eyed parent with a newborn, you also want to turn on the tunes. According to the National Association of Music Merchants (NAMM) Foundation, infants sleep better and are more content with a better sense of wellbeing when they listen to music and are sung to. Women who are expecting should play music, too. A baby’s hearing develops during pregnancy around week 16 and by week 24 they will turn their head in response to sound. If you are in your second or third trimester take out those ear buds and play music so both of you can listen! Your little one may recognize your favorite song when they are born. You do not have to play Mozart to have your children experience the advantages of music exposure. Children’s songs with repetition and rhyming are highly enjoyable and offer additional benefits to little ones, like recognition and memorization, which is why nursery rhymes and lullabies are recommended for babies and toddlers. But you can really play any kind of music, as long as it is not too explicit or violent. Play what you love and expose your child to a lot of different genres. Don’t be surprised when they quickly develop their own preferences which they will absolutely make known – even if they cannot yet speak! Killian’s favorite song at the moment is No Roots by Alice Merton. We played it for him once and his response told us he loved it. If we put on some music that he is not into, he lets us know that, too. Listening to any kind of music – whatever you all enjoy! – stimulates important developing areas of a child’s growing brain which leads to all those developmental gains. It usually stimulates their smiles and dance moves too. Win, win! Children these days are inundated with media and it is crucial for us parents to limit and monitor that exposure. The American Academy of Pediatrics recommends that children under 18 months do not watch television or use tablets. Toddlers should have no more than one hour of high-quality programming, like Sesame Street, each day and children older than six years old should have consistent limits on time spent using media. But there is no limit on the amount of music they can hear and play! Music is a joyful and creative outlet that enriches children in so many ways. Consider switching some of your kid’s TV and iPad time to music time. It is easy to create new routines and play activities involving music. Have a dance party in your kitchen every morning before you start your day. Sing nursery rhymes and children’s songs or get your little one giggling with silly, made-up songs. Buy or make musical instruments for babies and toddlers like drums and shakers. Attend free music classes at your local library. Incorporate music into your child’s daily routine by playing the same songs during bath time or signing a special song every night before bed. Stop and listen to street musicians in the city. (Students from the Curtis Institute of Music are known to frequent Rittenhouse Square and perform classical pieces for all passersby to enjoy!) Support music education in all schools so every child has the opportunity to learn to play an instrument. Consider getting your child his own musical instrument for advanced instruction, enrolling him in piano lessons or singing classes. At the very least, play all kinds of music in your house and car. Everyone in your home will benefit! What are your favorite music activities with your kids? How do you incorporate music into your everyday routine? Share with me and other parents in the comments section below or Tweet me @ThePhillyVoice and @KathleenEGagnon.